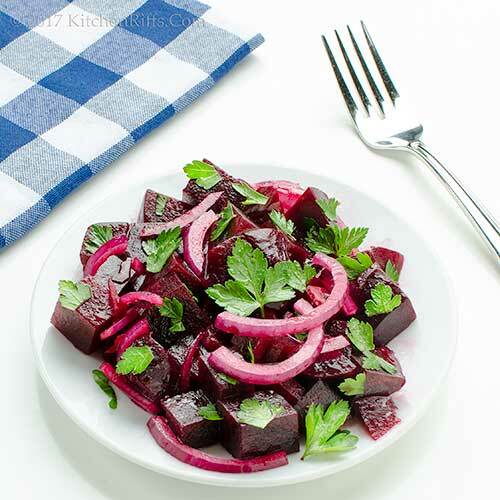 For this dish, you need to cook the beets first, then let them cool before making the salad. We like to oven-roast (actually, oven-steam) the beets, but in the Notes we provide instructions for boiling if that’s your preference. We recommend buying bunches that contain beets of roughly equal size – that way their cooking time is more even. We like to put this dish together right before serving. But you could mix it up an hour ahead, if you wish, and refrigerate it. Prepping and cooking the beets takes around 45 minutes. But once they’re ready to go, you can make this dish in about 10 minutes. Preheat the oven to 400 degrees F. Cut the leaves off the beets, leaving an inch or so of stalk attached. Do not cut the root ends. Scrub the beets, then wrap each one in foil. Place the beets in the oven and cook until they’re just tender – 30 to 45 minutes, depending on the size of the beets (usually about 40 minutes). When done, unwrap the beets and allow them to cool. Peel the onion, then cut it into thin slices. Add the onion slices to the beets. Add the olive oil, then toss the ingredients together to coat them. Add the vinegar or lemon juice, and toss again. Add salt and black pepper to taste. Wash the parsley, spin it dry, then chop it. Mix the chopped parsley with the beets and onions. If you prefer to cook the beets on the stovetop, here’s how: Cut the leaves off the beets (leaving an inch of stalk attached). Do not cut off the root ends. Wash the beets, then add them to a cooking pot filled with cold water. Place the pot on the stovetop, then bring the water to a boil. Reduce to a simmer and cook the beets until they become tender – 30 minutes or so. Drain the beets in a colander (you might want to reserve the cooking water for soup). Rinse the cooked beets under cold water to cool. You can add a clove or two of minced garlic to the beets for extra flavor. Want even more flavor? Add ½ teaspoon of ground cumin. For yet more flavor, you can substitute fresh mint for the parsley. If you’d like a more substantial salad, add some crumbled goat cheese or feta to the mixing bowl (we’d suggest a handful or two). You could also try adding some cooked chickpeas (we haven’t tried that yet, but it sounds good). We use kosher salt for cooking. Kosher salt is less salty by volume than regular table salt (its large crystals don’t pack as densely). If using regular table salt, start with about half as much as we suggest. But, as always, adjust the salt (and black pepper) to your own taste. Beets usually are sold with their greens. 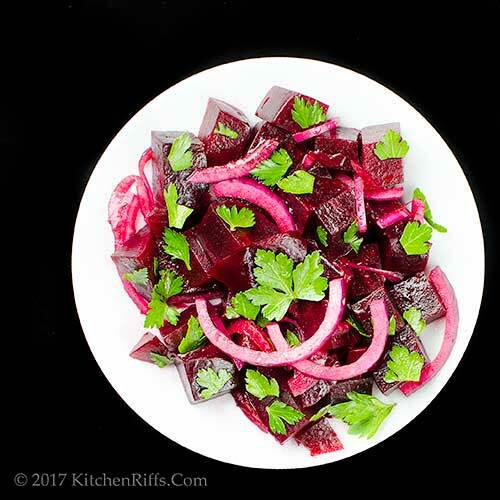 If the beets are young, you can use the greens raw in a salad. Otherwise, cook them as you would spinach or other greens. BTW, the color in beets doesn’t break down in your digestive system. So they can tinge your urine and stool. Just so you know. “You soiled your reputation with that comment,” said Mrs K R.
“I could have you charged with spousal pun-dangerment for that comment,” I said. True. She’d wrap the beet. One of my favourites! And beet greens are truly wonderful too. I only wish that my husband loved beet. Your salad looks so fresh and awesome. Hi Angie, beets are just good, aren't they? Didn't like them when I was a kid, adore them now. :-) Thanks for the comment. I love beets. I think every one of your additions - from the cheese to the cumin - sounds fantastic! Hi Jeff, you can do a lot with this basic salad -- really customize it. :-) Thanks for the comment. I actually think this would also be great with hot beets. They would soak up the dressing and temper the onions a little. I love playing with temperatures like that. Hi Laura, great idea to try this with hot beets! Gotta try that. :-) Thanks for the comment. Hi Pat, beets are wonderful, aren't they? Can't get enough of them -- particularly at this time of the year. Thanks for the comment. Salad is perfect for this season. For a while beets were trendy in upscale restaurants: but they always put cheese in the beet salad. Your idea -- all veg -- is great. Unfortunately half of us are beet haters. Hi Mae, beets get a bag rap -- they're SO GOOD! But you're right that a lot of people can't stand them, alas. Thanks for the comment. I love beets and could literally make a meal on them. Your salad looks so fresh and pretty. Just a touch of onion for that added zip. Beautiful! Hi Vicki, love the flavor and color of red onions! And beets, of course. :-) Thanks for the comment. Hi Kelsie, we can't get enough of beets, either. Really good! Thanks for the comment. Beets in foil in the oven is the best way, makes a lovely cooked beet. And this salad is hard to BEET as well, great summer flavors...now that is it super hot here but only for 2 days. This is so purple! Looks like this will go well with a heavy meat course. Nice! We love beets, too. I agree they taste earthy. Pretty salad! Hi Evelyne, it's been hot here too, lately, so this salad is most welcome. :-) Thanks for the comment. Hi Deb, leftovers of this are really good! Thanks for the comment. Hi Raymund, isn't the color great? As is the flavor! Thanks for the comment. Hi Bobbi, actually, any kitchen cleaner with bleach takes the color right out! But yes, I wear gloves. :-) Thanks for the comment. Hi Lydia, aren't beets wonderful? Love their flavor! Thanks for the comment. 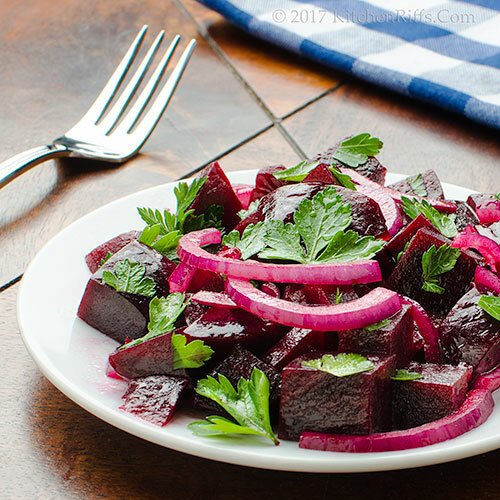 What a perfectly beautiful salad John; I love both beets and red onions. Believe it or not, we have more snow forecast so no beets in Denver yet but soon I'm hoping so I can give it a try! This looks like a pretty great appetizer salad before the main event... IE: juicy grilled STEAKS! ;) haha! This is so pretty! And so easy. Plus, it goes with just about any kind of main dish. The vibrant colors are sure to put a smile on anyone's face. Hi Barb, more snow?! Wow! Maybe beet soup? :-) Thanks for the comment. Hi GiGi, these would be great with steak! :-) Thanks for the comment. Hi Carolyn, beets looks just gorgeous, don't they? And tastes better. :-) Thanks for the comment. Healthy and delicious... and quite pretty too! Just wanted to say that I made this for dinner tonight, and it was absolutely delicious! Thank you for the recipe! Hi Denise, it's nice, isn't it? Love its color! Thanks for the comment. Hi Juliana, simple is good! Often the best way to enjoy food. :-) Thanks for the comment. Hi Mango, glad you enjoyed it! Thanks for the comment. The vibrant color of the beet says it all. Looking so delicious and full of flavor. And wouldn't this salad be great with your beef brisket after a Pimm's Cup? Hi Holly, this really is such a nice color, isn't it? And the flavor is superb! Thanks for the comment. Hi Rosemary, bbq beef brisket and Pimm's Cup would be most excellent with this! :D Thanks for the comment. Hi Mimi, goat cheese makes a nice addition to this! And looks great. Thanks for the comment. I love a good beet salad, especially when the beets are roasted. It's such a healthy treat. Thanks for the recipe John . Hi Gerlinde, this really is healthy. And exceptionally tasty. :-) Thanks for the comment. Hi Anne, one of the neat things about tossing the salad with first the oil and then the vinegar is you give the beets extra time to "bleed" -- so the color of the salad is more intense than it might otherwise be. Thanks for the comment. We love beets around our house, the tops too! Love how you spiced up this salad, looks amazing! Hi Amira, snow in May must be tough to take. :-( Anyway, you -- or rather your husband! -- has this to look forward to when the weather finally warms up! Thanks for the comment. Hi Cheri, beet tops aren't used nearly enough. They're so good. As, of course, are the roots! Thanks for the comment. What a beauty! Great flavors, colors, and textures. Hi Pam, this really is pretty, isn't it? And has wonderful flavor! Thanks for the comment. It's recipe like this that make me want to give beets another try. What a gorgeous color! Thanks John for your inspiration. Cooked beets are like candy to me, I can't stop eating them! My sister makes a similar salad with the addition of fresh corn...yum! Hi MJ, we love beets, but not as kids. Now? Can't get enough of them! Thanks for the comment. Hi Sue, like the idea of adding corn! I'm so going to steal that idea when fresh corn season is here. :-) Thanks for the comment. I like eating beets, but my hubby won't touch them. Maybe this salad would convince him to try them again. This salad looks delicious! I love the color of beets. Hi Dawn, beets are so pretty, aren't they? Not to mention good. Your hubby doesn't know what he's missing! Thanks for the comment. This sounds great, I love how purple it is! Hi Caroline, great color, great flavor. Great dish. :-) Thanks for the comment. Hi Ritu, it IS yum! :D Thanks for the comment. We adore beets of every colour but the red ones are my absolute favourite. I usually like to add a bit of goats cheese, so delicious! Hi Eva, the red ones are our favorite, too, simply because they look so magnificent! Love their color. :-) Thanks for the comment. I'd love to try this recipe with golden beets, my favourite. And goat cheese, yes please! Hi Beth, golden beets have terrific flavor, don't they? Haven't made this dish with them, but should. :-) Thanks for the comment. LOVE IT!!!! I walked past the green grocer the other day and saw 5kg of beetroot for $2. I should of bought them. Looks like a gorgeous and oh so healthy salad. I need this in my life. :) Thanks. Hi Anna, wow, that's an excellent price! And yes, you do need this in your life. :-) Thanks for the comment. Beet salads are one of my all time favorites. I like them plan or combined with other ingredients. I'll have to try your suggestion of adding cumin some time. Hi Karen, a small amount of cumin adds interesting flavor to this dish! Never tried cinnamon, and wonder how that'd work. Or it's really good just as is! :-) Thanks for the comment. This salad looks terrific, John! We love beets here and the cumin sounds lovely. Hi Amy, beets are so good, aren't they? And lovely in this dish! Thanks for the comment. I bet this salad would also taste good with golden beets, which are my favorite. And what a bonus, with the 'red tinge' staying in your digestive system the next day! Hi Fran, golden beets are wonderful! Haven't made this dish with them, but bet it'd be terrific. Thanks for the comment. I love easy salads in the summer but packed full of flavor. This one has it all! Oh, boy, it has been WAY too long since I've made anything with beets! This simple, delicious salad is the perfect place to start! 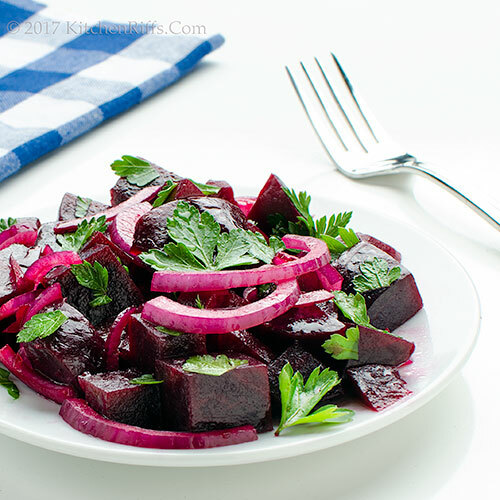 I love beets and this is the perfect light summer meal! I am so into purple veggies right now. What would happen if you threw some red cabbage in? Hi Ashley, easy and flavorful is good! And this sure delivers. :-) Thanks for the comment. Hi Liz, we love beets! And this dish really has super flavor -- you'll like. :-) Thanks for the comment. Hi Katerina, isn't this nice? And you're right -- ideal for this time of the year! Thanks for the comment. Hi Debra, red cabbage is such an interesting idea! Gotta work on that. :-) Thanks for the comment. We love beets too and especially with onions. I could make a dinner out of this plate! HI Tricia, beets and onions pair so well, don't they? Wonderful combo! Thanks for the comment.